Currently more than 1,000 companies, including Nestle, Ceva Logistics, Helukabel, Sinopec Petroleum, and Metalloinest have business operations at Dubai World Central (DWC)’s Business Park Free Zone and the number of companies coming aboard is increasing by 10 to 20 per cent monthly, a DWC statement statement says. DWC is keen that the business park hub expands by leaps and bounds and recently hosted key activities to promote the park free zone amongst the country’s growing business community. Groups taking part were the German Emirati Joint Council for Industry & Trade, Australian Business Council, Russian Business Council, Benelux Business Council, and South African Business Council, among others. DWC-Business Park also supported the Inter Business Council Networking Evening 2014 as one of the event’s main sponsors. 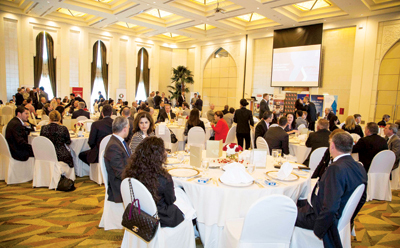 Held at the Hotel Sofitel Downtown Dubai, the event gathered more than 400 members of 21 international business councils to recognise their contributions to Dubai’s exponential growth over the past years. The activities provided a platform for DWC Business Park to network with leaders and decision-makers and showcase its world-class facilities that meet the unique requirements of various business entities. Moreover, the DWC Business Park – as the bronze sponsor – served as the key partner of the Canadian Business Council in their latter’s recent activities. The Business Park Free Zone also organised networking events attended by its partners, clients, and members of different international business councils and chambers, giving all the attendees the venue to discuss the latest developments and explore the numerous opportunities at the Business Park. The DWC-led activities also provided insights about the UAE’s business landscape and DWC Business Park’s competitive edge. Paolo Serra, vice president, Business Park at Dubai World Central, said the park, one of DWC’s major components, offers a fully integrated business environment over and above its state-of-the-art amenities and infrastructure and that it is designed ground up around the concept of business facilitation. Business Park offices are available in three different sizes-small offices of 45 sq m to 90 sq m, medium offices of 100 sq m to 400 sq m and large offices of 500 sq m and above. It provides advantageous car parking ratios and all the technological amenities required of a space to make it business-ready and conducive to quick and easy transactions. In addition, flexible commercial lease terms are available. DWC is a 140 sq km purpose-built aerotropolis with Al Maktoum International Airport as its core. DWC has been designed as a self-sustaining economic zone to support a multitude of activities including logistics, aviation, commercial, and exhibition, humanitarian, residential and leisure related business. DWC is strategically located next to Jebel Ali Sea Port, the sixth largest container terminal in the world. Upon completion, Al Maktoum International Airport will become the world’s largest airport handling up to 160 million passengers and 12 million tonnes of cargo per year.